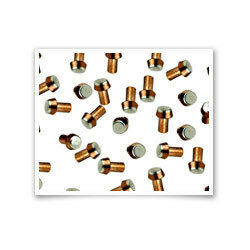 Our clients can avail from us a quality-assured range of Bimetal Contact . These are manufactured using silver and are suitable to replace solid contact rivets. We make use of cheap base metal(generally OFHC Copper) to produce shank and part of its head. Further, the upper part is made using contact materials. The contact material and base metal are fixed with welding. Generally, more copper and less precious material are used to make larger heads and shanks economically possible. It ensures proper heat absorption and dissipation. The head of these rivets are of diameter 2.0 mm-10 mm. Owing to our vast experience of 31 years in this domain, we have been successfully providing Tri Metal Contact Rivets, Bimetal Contact Rivets, Contact Shapes, Button Contacts and Solid Contact Rivets. All our products are widely acknowledged for their features such as mechanism strength and tear & wear resistance and durability. Further, our range of contact shapes is widely used in telecommunications, electronics and other general purposes. We ensure that all our products are manufactured using high quality material ensuring the production of a flawless range. In order to offer a superior range to the clients, we have developed a sophisticated infrastructure unit. This unit is employed with all the necessary amenities and advanced machines. For the proper functioning of this unit, we have hired experienced personnel, who hold extensive knowledge of the market requirements. Our professionals work with the aim of attaining utmost satisfaction of our clients. Further, we supply our quality-assured range to our clients in Indian Subcontinent, East Asia, Middle East and South East Asia with the support of our wide distribution network.